Thom Donovan is an exemplary Post-Fordist laborer. He works as a poet, critic, scholar, archivist, professor, editor, and curator. His book The Hole can be purchased at SPD and he is currently working on his second book of poetry and first book of critical essays. He is the author of "Somatic Poetics," an essay regarding contemporary somatic practices and aesthetic discourse, and is a founding participant of the Nonsite Collective. For more information visit his blog Wild Horses Of Fire, now in its eighth year. Bhanu Kapil is a writer and bodyworker who lives in Colorado. She was a speaker at the third world congress of the World Association of Cultural Psychiatry in London, where she spoke about psychosis and the immigrant experience: the role of communal light touch and devotional acts as resilience factors. For the body. As for the text. Beth Murray is a poet and homeopath with a practice for people and animals in the bay area. Last year she recovered from advanced breast cancer using a combination of modalities. To find out more about her recovery visit www.healingmycancer.wordpress.com. Pavlos Stavropoulos is a longtime activist and organizer involved in numerous local, national and international liberatory and anarchist struggles, including anti-fascist and anti-austerity resistance in his native Greece. He is a founder of Woodbine Ecology Center, which focuses on sustainable communities and indigenous perspectives, a certified permaculture designer and instructor, a water and sustainability educator, a street medic and a father. A longtime union organizer, writer on performance and experimental sound composition, and former body artist out of Detroit, david wolach is founding editor of Wheelhouse Magazine & Press. wolach’s first full-length collection of poems is Occultations (Black Radish Books, 2011, 2012). 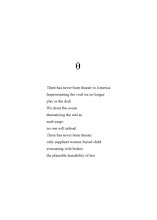 The full-length Hospitalogy is due out from Tarpaulin Sky Press in May of 2013. wolach is professor of text arts, poetics, and cultural theory at The Evergreen State College, and visiting faculty in Bard College’s Language & Thinking program. In collaboration with The Poetry Center, Eleni Stecopoulos has curated programs featuring participants from diverse fields, including philosopher Alphonso Lingis, poet Raúl Zurita, anthropologists Barbara Tedlock and Dennis Tedlock, physician-poet David Watts, performance artists and disability culture activists Neil Marcus and Petra Kuppers, and many others. Author of a poetry collection, Armies of Compassion (Palm Press), and a recent chapbook, Daphnephoria (Compline), she is finishing a book on the poetics of healing. Translation. Making space. Integration. Alternation. Tuning in/out. Turning down/up. Working (in) the dark. Attendance. Nursing. Cultivating the void. "not to be stepped into"
"I passed cancer two years ago"
I came across this article by John Lundberg in the venerable HuffPo recently: Can Poetry Heal? "Longo also speaks to a third potential benefit of writing poetry: that writing a poem can help to clear up one's emotions on a complex issue." "Experts are careful to stress that poetry is a tool, which, wrongfully employed, can hurt rather than heal a patient. But many feel that it has significant potential. In a Time Magazine article on poetry therapy, Yale Psychiatrist Albert Rothenberg offered that "poetry by itself does not cure," but noted the benefit of its unique focus on verbalization, which, he offered, is "the lifeblood of psychotherapy." Calling Robert Kocik here - by subtlest and therefore most potent means - to treat the iatrogenic effects produced above...gathering myself for emergent measures...induce the chronic to remediate the acute..
Poets, still trying to make poetry anesthetic to remove the sting of aesthetics? Psychiatrists, still trying to defang poetry into talking cure? 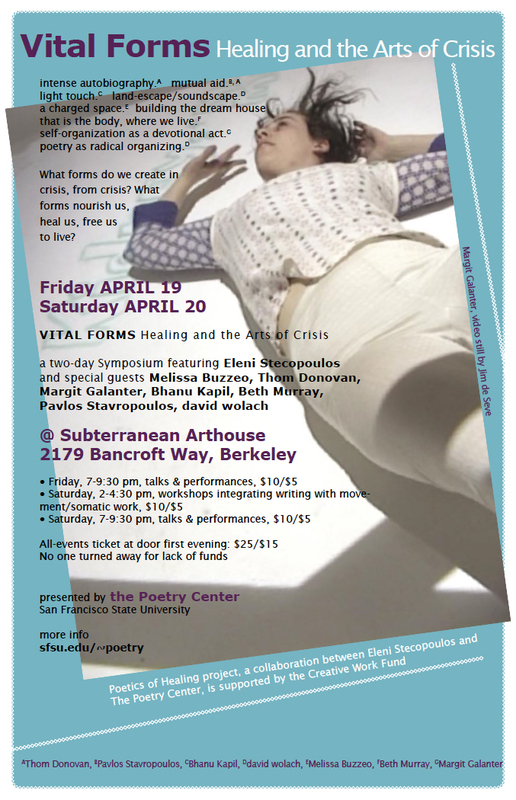 The Poetics of Healing: Creative Investigations in Art, Medicine, and Somatic Practice is a collaboration between Eleni Stecopoulos and The Poetry Center at San Francisco State University, sponsored by a grant from the Creative Work Fund. It includes a series of public programs and a book by ES drawing on the programs as live research (notes toward/writing in progress to be posted here.) What can happen in an experiment that gathers a range of people to explore the empathic imagination, sound healing, physical intelligence, trauma and trance, architecture as healthcare, the community of those who have nothing in common, damaged language, poetry therapy and poetry as not-therapy... These are some places I'm led to.